Does your receiver feel too hot? Do you have other electronics equipment that is uncomfortably warm? Does your Cable Box DVR skip when you are playing back recorded shows? It might be time to think about some active cooling. Most A/V electronics passively draw heat from underneath and the sides through their body, across the heat sinks, ultimately letting it rise away through the vents on top of the unit. Thus, helping air vent through the top of the equipment is an effective way to keep it cool. For those of us who have equipment in tight cabinets or situated tight against other equipment, a small investment in some cooling fans will go a long way. Your equipment will run at a cooler temperature, increasing its lifespan and its efficiency. 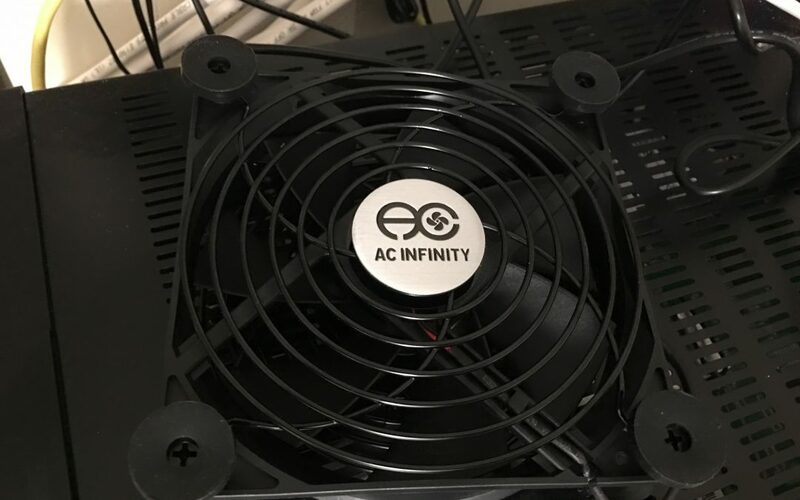 You can either buy some computer case fans and wire them up with adapters or you can take the easy route and buy one of the options from AC Infinity. They offer active cooling solutions for a low price, which are quiet, reliable, and easy to install. I chose to go with the AC Infinity Multifan S7, which offers two 120mm fans with silicone feet on both sides that move 104 CFM. There are, of course, fans which move more air and less air, but at this price point these fans are a great option. They come wired together, ready to plug into a USB port, with a fan speed controller and a female USB power port to daisy chain two more fans. The fans are rated for 67,000 hours, can sit vertically or horizontally, and have ball bearing construction, which means they are quiet. For $22 on Amazon, it’s tough to argue against protecting your expensive equipment. These fans are a great options for not only cooling your A/V equipment, but your Xbox, PlayStation, DVR, or any other electronics that run at high temperatures. Most new equipment has a USB port to power the fans, so getting them running is pretty simple. Otherwise, you can always pick up a USB charger from Amazon for under $10, or any old phone charger will do – just make sure it has enough amperage. AC Infinity makes cooling options for all price points.